The Aeolian Islands have a Mediterranean climate: winter is mild and relatively rainy, with sunny periods, but also periods of bad weather, characterized by wind and rain, while summer is hot and sunny, a bit sultry but tempered by the breeze. In spring, in April and May, sometimes in the morning fog can form. Although the temperature is generally mild, the wind, which blows especially in the cold half of the year, can increase the feeling of cold. The Aeolian archipelago is located north-east of Sicily, and includes the islands of Lipari, Salina, Vulcano, Stromboli, Filicudi, Alicudi and Panarea. Being volcanic islands, they host some elevations in the interior. 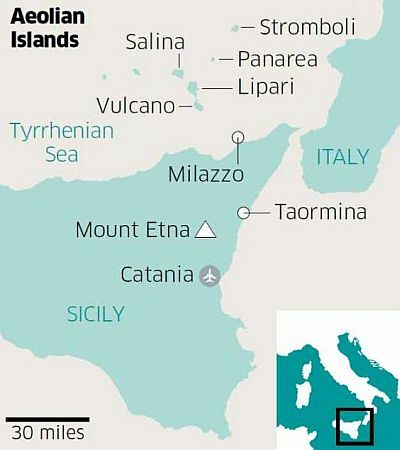 In particular, the maximum height is the following: in Lipari, 602 meters (1,975 feet) above sea level; in Salina, 962 meters (3,156 feet, in Mount Fossa delle Felci); in Vulcano, 499 meters (1,637 feet); in Stromboli, 926 meters (3,038 ft, in the volcano of the same name); in Filicudi, 773 meters (2,536 feet); in Alicudi, 675 meters (2,214 feet); and finally in Panarea, 420 meters (1,378 ft). On the slopes of these hills, small forests are found. In the plain, the minimum temperature does not drop to 0 °C (32 °F) even during cold spells, and snowfalls are extremely rare, while they are a bit more frequent at an altitude higher than sea level. The highest temperatures, which occur when the Sirocco (south wind) blows from Africa, are around 38/39 °C (100/102 °F), and are recorded from June to August. For example, here are the average temperatures of Salina. The rain pattern on the Aeolian islands is Mediterranean, with a maximum in autumn and winter, when thunderstorms are fairly frequent as well, a drop in spring, when there is already little rain, and a minimum in summer, when it rains very rarely. Since we don't have any data on the rainfall of the Aeolian Islands, we refer to the average rainfall in Ustica. 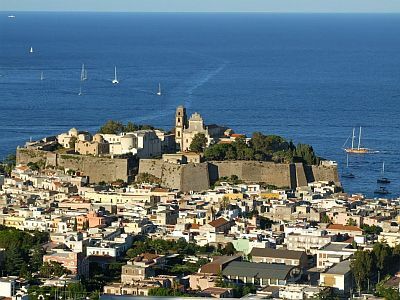 The amount of sunshine on the Aeolian islands is great in summer, when clear skies prevail; in winter, sunny periods, which can occur in this season too, alternate with cloudy periods. In this case too, we refer to the data of Ustica. The sea on the Aeolian Islands is warm enough for swimming from July to September. In June, the sea is still a bit cool, only 21 °C (70 °F), while in October, after the summer, its temperature is still decent, about 22 °C (72 °F). 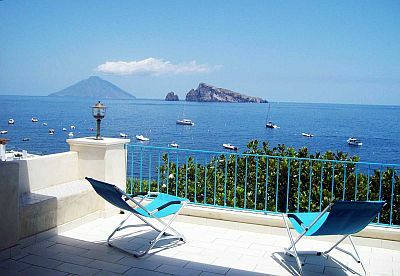 The best time to go to the Aeolian Islands, for a beach holiday, is the summer, from June to August. The water temperature is comfortable enough from July to September, but in September, which overall is still a good month (especially in the first half), the first weather disturbances begin to affect the islands. In June, as mentioned, the sea is still a little cool, while in May it is even cold, and sometimes the air too can get a little too cool for sunbathing (perhaps because of the wind). April and May are ideal for hiking, while in summer it can sometimes be too hot for outdoor activities (especially in July and August: in June and September the temperature is usually enjoyable or at least tolerable, except when the wind blows from Africa). In October, temperatures are mild, but the days are shorter and the weather can be rainy and windy.